The growth in the number of staff working from home accessing sensitive data should provide security resellers with a growing sales opportunity. With the category of 'distributed enterprise' security products starting to emerge, prospects for resellers targeting firms with staff working remotely is one that WatchGuard is expecting to deliver rewards for its partners. The vendor recently took the wraps off its own SOHO UTM box, the Firebox T10, designed to offer protection for workers accessing the corporate network at home. Jon-Marc Wilkinson, distribution manager for UK and Ireland at WatchGuard, said that the distributed enterprise was a growing problem for users that had senior staff working from home accessing important data. 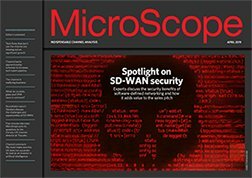 "A lot of users are sat behind the firewall provided by their ISP but they are not going to get the same policies enforced that they would sitting on a corporate LAN," he said. "The opportunity for partners is around enforcing compliance and our research shows that 40% of companies do not look at the logs of people working at home," he added. Martin Lethbridge, sales engineer UK and Ireland at WatchGuard, said that when a product was being sold to a corporate with the destination of being used in the home the key was to keep it simple and make sure that it could be installed quickly by the user. He added that its resellers were being given the option of providing the configuration for customers to give an extra chance to add some value.